The STAR compliance application is supported by unrivalled technology in our hosting facilities, servers and in the software itself. We develop our application entirely in-house, with no third-party components or features, ensuring the highest standards of data privacy and safety. With our extensive automation and customization facilities, as well as our advanced implementation and security options, your compliance processes will be safer, more rigorous and more efficient than ever before. Our team of expert developers, analysts and specialists work tirelessly to constantly evolve our product to meet the diverse needs of clients and the ever-changing regulatory environment. Users sign in to the platform using existing credentials and a single ID and password, providing fast, easy access to all products within your STAR application. 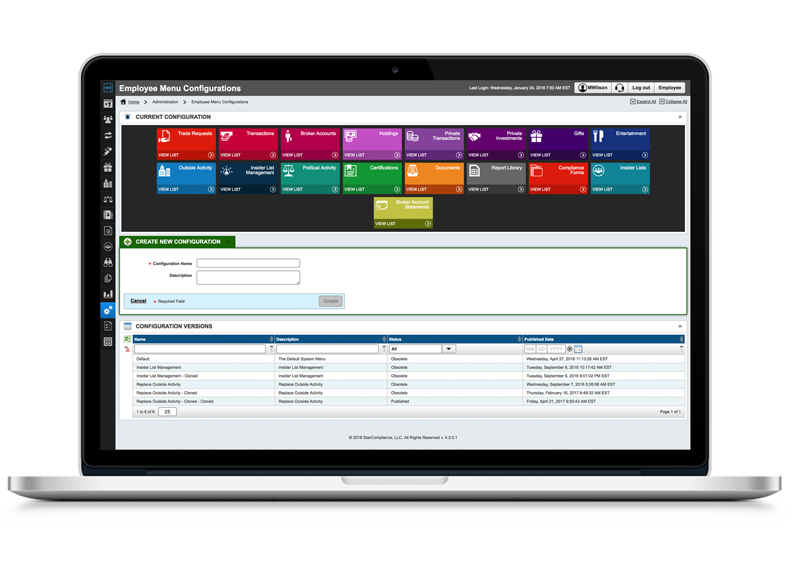 Seamless integration with your HR systems saves time populating and updating the STAR platform. Using data from your master HR records allows employee details to be easily added and removed, while pushing data from your master records enables individual account information to be completed automatically. Your STAR platform can manage the varying requirements of multiple business divisions, each with differing workflows, processes and certification requirements – simplifying complex compliance requirements through a single, user-friendly system. The versatile STAR platform has been designed to operate in different countries, with no need for redevelopment every time you add a new territory or language. The system can easily be tailored for each country, with date, time zone and local currency adaptations, alongside language translation capabilities. A configurable rules engine enables automated approvals, denials and case creation based on your organization’s unique code of ethics. The STAR system is flexible and works seamlessly with other platforms, offering full integration with many different enterprise systems. STAR is characterized by its configurability, making it the most personalized compliance service on the market. Your STAR application can be entirely configured to your requirements through extensive, easy-to-use options and management tools. Even the most common features of our STAR platform, such as transaction submissions, are powered by our advanced rules engine, meaning that automatic approval and denial features can be customised to your specific requirements. Forms, attestations, declarations, user accounts, visibilities, permissions, roles, personas – everything can be configured to meet your needs. While you are welcome to host the STAR application data at your own site, there are many benefits to managed hosting at our state-of-the-art, Tier-3 data centers. These include exceptional levels of security to protect your data and the most robust back-up systems to ensure your data is always ready for you to access at any time. Learn more here.